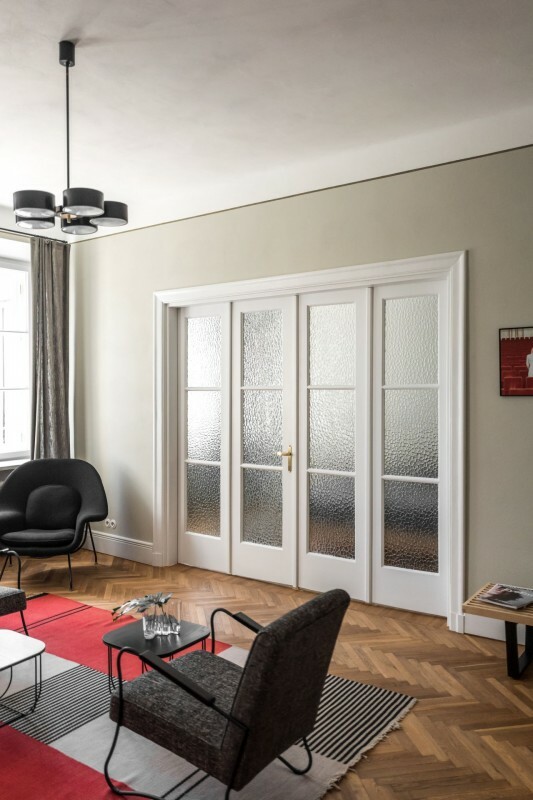 “The flat is located in a tenement house from 1929, designed by Roman Feliński, on Filtrowa Street in the Stara Ochota neighborhood. The project included revitalization and partial reconstruction of all rooms. One of the main goals of the project was to make a reference to the historical character of the apartment. The walls are covered with a traditional plaster while decorative finishes were painted by hand. Wooden joinery and parquet floors have undergone a renovation, which was performed by craftsmen specializing in restoration of monuments. The flat was equipped with furniture designed and made by Loft Kolasiński: table, bed, mirrors, kitchen and bathroom furniture. Designed and made for the project was also a steel wardrobe development and steel ventilation grilles and curtain rods. In addition, in the project, there were used unique furniture, lighting and carpets by designers such as Maria Chomentowska, Antonin Kybal, Eero Saarinen, Kai Kristiansen, Franz Hohn, Władysław Wołkowski, Nelson Bench and Roger Lecal. A unique detail of the apartment’s furnishings are armchairs from the factory in Zadziel the 1950s, which have undergone specialized refurbishment. The photographs of Maria Svarbovej were used to decorate the walls.